Infrared spectroscopy is mostly employed for the qualitative analysis in structure elucidation, fingerprinting, following the course of a reaction and in the identification of Polymorphs. Utilization in quantitative analysis is less precise as compare to other analytical methods and is rarely used. The degree to which IR spectroscopy is employed in structure elucidation is limited. 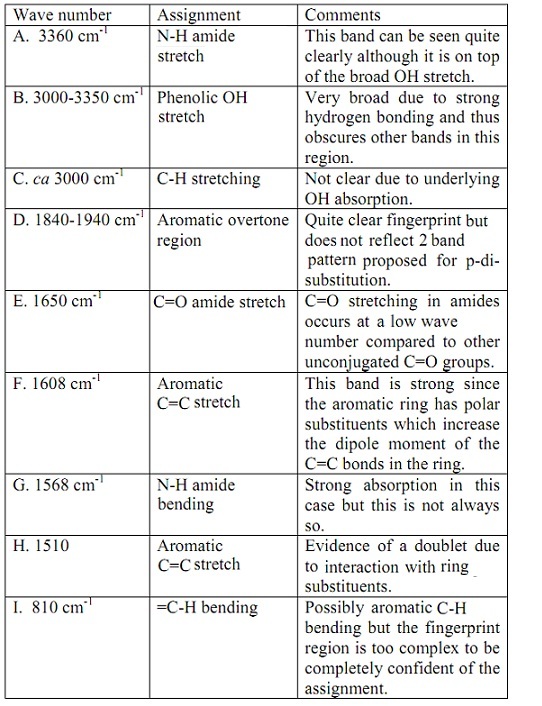 The information that can be obtained is limited to recognizable bands in the IR spectra of molecules. The most readily assigned absorptions are generally at > 1500 cm-1. The letters s, m, and w point out that the absorptions are generally strong, medium or weak. Groups of letter point out that the peaks might have different strengths. Note 'm' refers to peaks due to only conjugated C=C bonds. 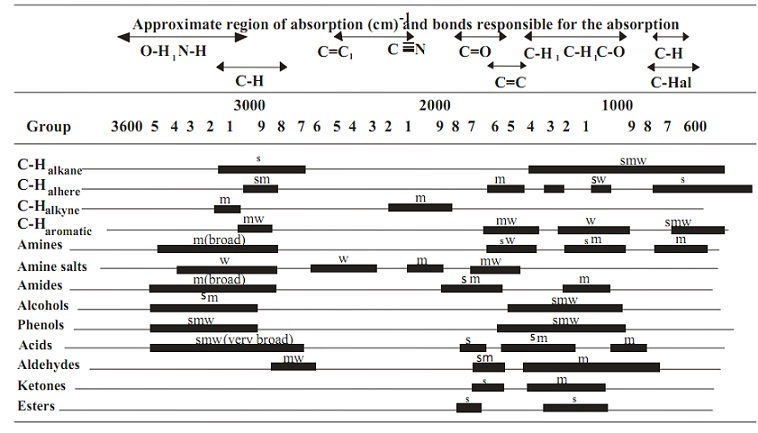 In practice, it is complicated to correlate the absorptions by functional group structures in the region below 1500 cm-1. This area, due to its complexity, is termed as the fingerprint region. It is particularly helpful for recognizing an unknown compound via comparing its spectrum with the spectra of known compounds recorded under the similar conditions. Whenever the spectrum of the unknown matches that of a known compound it is probably the similar compound. This method is termed as fingerprinting. Deductions made via infrared fingerprinting must be supported via additional proof. IR spectroscopy all along with the differential scanning Calorimetry and X-ray powder diffraction gives a process for characterizing the polymorphic forms of drugs. The existence of polymorphs, various crystalline forms of a substance consists of a significant bearing on drug bioavailability, the chemical processing of the material throughout manufacture and on patent life-time. Until recently the standard process of sample preparation for characterizing polymorphs by IR was via employing a Nujol mull to prepare the sample. Though, the DRIFT method has a benefit as it doesn't introduce interfering peaks that are present in Nujol and which might obscure areas of interest in the fingerprint region of the spectrum. Moreover, low polarity samples might be soluble in Nujol, therefore causing their polymorphs to break-down. Infrared spectroscopy is employed to follow reactions via observing the disappearance and appearance of relevant peaks, for illustration, the synthesis of ethyl benzoate from benzonitrile (Figure shown below). Though, samples should be isolated from the reaction for precise analysis. In the figure above, the first step, the sharp peak at 2228 cm-1 due to the nitrile disappears and a wide peak due to the absorption of the O-H bond of the carboxylic acid appears. In step two, the broad carboxylic acid peak is replaced via a narrow peak due to the aromatic C-H bond absorption whilst the peak at 1682 cm-1 due to the carbonyl group of the carboxylic acid is replaced via a narrow peak at 1718 cm-1, because of the carbonyl group of the carbonyl group of the ester. It must be noted that however the spectra in this figure are run in different solvent systems, it is still possible to make use of them to follow the synthesis. Though, due allowances should be made if different solvents are employed whenever following a synthesis. Infrared spectroscopy is rarely use for quantitative analysis as less precise than other analytical methods. Though, it does have one benefit over ultra-violet and visible spectroscopy. The large number of well stated absorption peaks signifies that it is possible to assay the individual components of a mixture given a peak which is due only to the substance being assayed (analyte) can be found. For illustration, automated quantitative infrared spectroscopy has been employed to find out the concentrations of contaminants, like carbon monoxide, chloroform and methanol in air. Though, it can be hard to locate peaks due solely to the analytes in an infrared spectrum of the mixture. This lets any absorbance by solvents or other components of the sample to be subtracted from the analyte peak. This lets the proper subtraction of solvents or other components. For illustration, if the spectrum of machine oil without additives is measured in a 0.1 mm NaCl cell, and then the similar procedure is followed for a sample having small amounts of additives, subtraction of the absorbance spectra will provide the spectrum of the additives in absorbance form. Gas analysis via IR spectrometry employing long path length cells has been employed to measure the concentrations of anaesthetic gases. For illustration, nitrous oxide, N2O, exhibits a strong absorbance at 2200 cm-1 at which the wave number of neither water vapor nor carbon (iv) oxide interfere. The measurement of concentrations between 2 and 50 ppm is possible by a 15 m path length gas cell, Trichloromethane (chloroform) provides a strong, sharp peak at 770 cm-1 and might be measured down to 0.1 ppm. IR spectroscopy has been employed to compute the mineral contents of rocks, asbestos and to study the residual solvents in Pharmaceuticals. Mixtures can be analyzed directly; however chromatographic procedures are generally preferred.